Malahat staff caught up with poet Mary Gait of Ladysmith, B.C., and creative nonfiction writer Lisa Horst of Sacramento, California, who first met on Instagram in 2014, and in 2016 planned their first in-person meet-up at The Malahat Review's WordsThaw symposium festival. The two share the origins of their friendship, what writing and literary community mean to them, and their experiences and highlights from WordsThaw 2016. Tell us a bit about yourselves, your apprenticeships as writers, and how your friendship developed online. How did you find each other? Mary Gait: I came from Ontario as the bride of a B.C. boy and have been living on the West Coast for over thirty years. I brought with me a B.A. (English), a year of teaching in a private college in my hometown as well as one year of teaching at an Educational college in central China. I had dreams of teaching at the post-secondary level while pursuing my writing, so I added two semesters of upper level English and one semester of graduate coursework at UVic. Three sons and a daughter over the next ten years changed my focus from formal education to lifelong learning of a different nature, always with a pen and notebook in hand. For as long as I can remember, words have intrigued me. I love the way they play on the page, how just the right combination of letters and sounds can evoke emotions and images which resonate with the human experience, how a thesaurus can be that skilled friend, seasoning a sentence like a chef enhances an entree. I thrill at etymology and grammatically correct sentences and confess to cringing at split infinitives and dangling modifiers in formal writing. In university I worked in the English Department office, tutored, contributed pieces to and did editorial work for our annual magazine. I have dabbled in writing—mostly poetry—for over four decades and have presented a small collection or two as gifts to gracious friends and family. Partial journals and scraps of paper are part of my archives, containing poems that are sometimes illegible and often heavily revised in search of that elusive Nirvana of form and feeling. I discovered Lisa on Instagram (IG) while posting a photo of a heart rock. Using the hashtag #heartrock led me to her gallery, and I can recall showing my daughter all the amazing hearts in nature on this feed. I have collected heart-shaped rocks for over 30 years. Turns out Lisa has been doing the same. Her intentional, heartfelt posting on IG is what connected us initially. That was in the spring of 2014. Since then we have discovered many other connections, including family size, teaching public school, and literary interests—to name a few. It was in the summer of 2015 that we connected through email, as Lisa kindly shared an article she had published in a local magazine. That began our more intentional literary connection, and we established a sort of pen pal relationship—literally! She wrote first, an actual handwritten letter, and sent along The Artist’s Way Everyday (Julia Cameron). That volume has become part of my (almost) daily reading and often gives me shivers of synchronicity. As a result of her own journey as a creative, Lisa offered insight and inspiration, encouraging me to explore my literary gifts, suggesting books to read and challenging me to let my voice be heard. Our writing relationship has become very reciprocal. We consult one another and offer support as we each take risks and grow as individuals. Of course some of that still happens via IG, as Lisa manages to maintain her commitment to 365 consecutive days of heart photos, usually found in nature. Her insights on life’s journey resonate with many of her followers, including me. Lisa Horst: I earned my M.A. from Teachers College at Columbia University. After teaching the primary grades for a few years, I decided to stay home when my first son was born. As a self-proclaimed feminist in college, I did not anticipate that it would be a twenty year position raising three sons and supporting my husband’s career. I have a couple of early publishing credits, and I owned two home-based businesses, but my family was always the first priority. I rediscovered my voice as a writer after an identity crisis a few years ago. Writing is a healing art form that helps me explore and navigate emotional turmoil. Mary and I connected on Instagram through our mutual affinity for nature and heart rocks. I believe Mary found my page initially and was always warm and supportive of my posts. Our “likes” and “comments” evolved into sharing more of ourselves through personal ‘DMs’ (direct messaging), letter writing, emails, and phone conversations. It is interesting to note that we were drawn to each other for a number of other reasons and similarities, as well. Not only do we share our experience as primary school teachers, but we are each one of five siblings (I am eldest and she is youngest) and we each have three sons (and she also has a much younger daughter). Furthermore, we are both in a place of transition in our lives and have found mutual affirmation in sharing this journey of reawakening to our own best selves. Evidence of our love of language and mindfulness surfaced and we began to share our writing with each other. How long have you been using Instagram? What led you to sign on, and what led you to stay? Does it inspire you, directly or indirectly, as writers? If so, how? Mary Gait: I started IG in March of 2012 with help from my children. Originally I posted in tandem with FB, but I dropped the latter in favour of the simpler format IG offered. Apart from IG, I get sufficient updates and photos through my texts and emails to keep me informed and connected. As for Instagram’s offering inspiration, I would say Lisa indirectly influenced me to post thoughtfully, and through my own journey of mindfulness, I became increasingly intentional in my posts. I chose to offer inspiration and meaning within this community and have encountered some lovely souls from around the world. Lisa Horst: My third anniversary on Instagram will be this August. I had no prior experience on social media of any kind. Knowing my affinity for photography, my three sons are the ones who urged me to sign on to Instagram and share my nature heart photography. My first heart rock was given to me almost thirty-two years ago, and I’ve been seeing hearts in nature since then. The giver of that first heart rock is now my husband of twenty-five years. Posting my photos online felt very exposing at first, and I kept my early comments to quick captions and titles. Soon, I began sharing meaningful quotes that were well-paired with the images. The international interest and encouraging response was unexpected. I slowly began including my own personal stories and reflections, fusing the images with ruminations about my experiences. Instagram became a place to post my daily intentions, of sorts. I was deeply moved by the comments left by people on my page. It is still humbling when the words I express profoundly resonate with people as timely or inspirational on some personal level. That realization makes the vulnerability of sharing my heart both worthwhile and affirming. This whole Instagram experience has been pivotal, directly and indirectly, in finding the courage to explore my voice as a writer. Kristen Noel published my essay about this journey in her publication, Best Self Magazine, last spring. Since then, I have been writing and submitting longer essays to journals. I am also in the middle of a year-long personal challenge called Matter of Heart. I am posting my heart images paired with my own writing, exclusively, every single day without fail. I am navigating life through the lens of love in order to define my daily essential truths. This process has been transformative. You met in person for the first time at The Malahat Review’s WordsThaw in March, 2016. How did that happen? What was it like, meeting for the first time, and attending a literary weekend together? Mary Gait: It was in January this year we discussed meeting in person, and that led us to our first phone call. It was new territory as we had relied thus far on carefully crafted emails, letters and comments to communicate. Now it was all improv and in real time. Once we established that neither of us was criminally inclined, something our families joked about, we determined Lisa would come my way. That is when a notice on TMR’s website about WordsThaw caught my attention. I pitched the idea that we could work around those dates in March. Lisa checked out the details and called with her enthusiastic response, affirming that she was indeed ready to take this step. When I met Lisa at the Victoria airport on the Monday before WordsThaw, it was surreal. We were already friends from a distance and had done much of the ‘getting to know you’ routine already, so we had a framework on which to hang this new experience. Those few days allowed us to get more comfortable around each other and gave Lisa time to meet some of my people here, to walk the same beaches I frequent, to eat in my favourite bistro, to find unique hearts in nature and to experience Island life in Ladysmith and Chemainus. Attending a literary event with Lisa was enriching and rewarding. As I am a poet and Lisa is a CNF writer, it seemed appropriate we would meet around an event highlighting the relationship between the two genres. I was very thankful to have Lisa there, as we could debrief and share our perspectives during and after each experience. Our responses were often similar yet at other times quite unique. Having someone who shares my academic and creative side made WordsThaw come alive for me. Lisa Horst: Mary and I are both on journeys of personal rediscovery. I was open to meeting her as an excuse to travel and explore the beautiful region of Vancouver Island for the first time. We connected on so many personal levels and meeting face-to-face seemed like a natural next step. I also had a goal to attend 2-3 literary experiences in 2016. I attended a publishing conference in New York City last year loved it. We were throwing around dates to meet in February when Mary tossed out the idea about meeting in March and dovetailing on the Malahat Review’s WordsThaw event. I immediately went online to check it out and one of the first things I read was “Fact, Metaphor, and the Single Voice: Where Creative Nonfiction Meets Poetry.” I got shivers and knew we found our weekend, and our adventure. It was synchronicity at its finest. Mary had already read my nonfiction essays and I’ve read her poetry so it was as if WordsThaw was destined to be our own point of intersection. I traveled out a few days prior to the event to spend time in her town and meet her family. The first time I saw Mary in person was through the glass doors at the airport. She is tall! All in all, however, she was just as I imagined: warm, gracious, thoughtful, intentional and mindful. We easily fell into stride together. It was a lovely few days exploring her turf and getting acquainted in person. The first day of WordsThaw, we drove down to Victoria and checked into a hotel together. We had a quick dinner and attended our first event together that night. Any highlights for you at WordsThaw: favourite events, panels, writers, moments? Tell us about them. Mary Gait: From Molly Peacock’s Lansdowne Lecture to the Words on Ice readers to the panelists and facilitators, and ending full circle with Molly’s sonnet I was enthralled, engaged, and encouraged. I found the variety of artistic styles and venues extremely satisfying. I have a new appreciation for Elizabeth May, having heard her story of determined advocacy for the environment. Kim Trainor moved me deeply with her profound piece and then through the sharing her craft with intellectual and literary acuity on the panel, aptly choreographed by Anita Lahey. Victoria’s own Poet Laureate, Yvonne Blomer, was present, often behind the scenes and participating alongside us in the sonnet class. Overall, the accessibility of these public, published personas was truly heartwarming and inspiring. These are gifted people who are willing to expose themselves on paper and thus challenge the rest of us as quizzically unique yet universally intertwined facets of humanity. I found the event well planned and yet very organic. The volunteers and staff are to be commended. It was a delight to be among thinkers, writers, accomplished authors and such a humble, unpretentious community of creatives. Each segment of the weekend left me with much to process, to mull over and to revisit as I filled pages in my notebook. Having Molly’s inaugural lecture and the sonnet class as bookends to the weekend seemed very fitting, making the entire event a lovely parallel experience for me and for Lisa as friends brought together through our mutual love of the written word. Lisa Horst: Molly Peacock’s talk on the first night blew us both away and we left the event soaring with inspiration. We hung on every word. Molly’s effervescence and passion are electric. She did a tremendous job explaining why creative nonfiction and poetry are natural allies and this, perhaps, highlighted the reasons Mary and I have such a natural and genuine appreciation for each other’s writing. Molly’s explanations about the compatibility of styles, and her delineation of the differences, expanded our readiness to push the boundaries of our own preferred writing styles further. I am a student at heart and read two of Molly’s books prior to my arrival, one I had to order from a bookstore in Canada as it wasn’t available on Amazon. Hearing her speak each day was definitely a highlight. The next night was another mind-blowing experience at “Words on Ice: An Evening of Readings.” I sat slack-jawed the entire night. I reveled in hearing so many divergent voices, styles, and sentiments. It was very rich, indeed. I find it truly difficult to pinpoint just one or two highlights at WordsThaw because each of the panels the following day left me inspired, informed, extended as well. The whole event was well-organized and thoughtfully curated. Each panelist was honest and candid in sharing their perspectives and experiences. The commentators were articulate and masterful in their seamless choreography of the unfolding questions and discussion. It was impressive to witness and enriching to experience. I have notes about every person who spoke, with take-away bullets from each, but I was deeply moved by Kim Trainor (from her poem Friday night to her panel contributions on Saturday). Jeremy Loveday’s poetic performance was like nothing I’ve ever seen and that stayed with me. There were fascinating discussions about poetry and research, as well. I loved the blurring of the genre lines as noted by the notion of “lyric essays verses prose poems.” Fascinating to consider! The list goes on. I even pushed the limits of my own experience by participating in Molly Peacock’s sonnet workshop at the end. Wow! Have your experiences at WordsThaw changed your writing practice, or the way you think of writing? How so? Mary Gait: WordsThaw did not so much change as clarify my writing practice and also provided a venue which fed my creative spirit. As Lisa puts it, we are both in our ‘second act,’ emerging from many years of supporting family members in their growth. This symposium came at a pivotal time in my writing journey. It was in Molly’s sonnet class that I faced the stringency of my academically-imposed form doing a bit of a tango with my emerging Phoenix, untamed, undaunted and uninhibited. The experience gave me impetus to commit to more intentionality in my writing pursuits. I can make time to write. I know that I want to—and often need to—write more often, simply as a way of responding to or explaining life. I recognize that both the process and the journey of writing are equally as fulfilling as the final product. Post-WordsThaw, I will continue to submit to publications, to enter contests, to attend literary events, and to give myself latitude to nurture my heart and soul so that I have continued flow and freedom in my creativity. Lisa Horst: Personally, my WordsThaw experience was perfectly timed. I am in the middle of a yearlong daily writing challenge that has done wonders for the practice of commitment and the release of perfectionism. Julia Cameron explores issues of flow in The Artist’s Way Everyday, and I was already beginning to awaken to the exploration of various narrative voices that are emerging. I left WordsThaw more open than ever before to the untethering of a deeper literary and poetic voice within. I am less filtered about the use of metaphor and prose, more embracing of my alliteration and message. Did you have a chance outside WordsThaw to explore Victoria? What did you do? Mary Gait: Coming into Victoria, Lisa noted how green everything is here. I paused at Goldstream Park on our way up Island just after she arrived to expose her to the wonders of the temperate rain forest. We made sure to stop there on our way to WordsThaw. It is always delightful to see your local environs through the eyes of a visitor. While in Victoria we enjoyed local restaurants downtown, a couple of which were new to me. The whole week was about flow, and that allowed us to be spontaneous. I was able to show Lisa a few spots that I thought she would appreciate, and we learned a lot about the recenter option on my Google Maps when my spontaneity got us slightly off course. Recenter evolved into a metaphor for life. Our only definite plan was to go to Butchart Gardens, and the conference schedule allowed us to take that in with ample time to stroll through the breathtaking Spring displays. The story of the gardens is, in itself, inspirational. 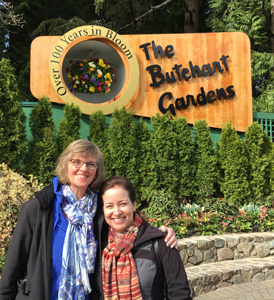 Lisa Horst: In addition to the time we spent in Ladysmith prior to the event, we did spend a beautiful sunny Friday afternoon at Butchart Gardens. It was my first time there and the perfect experience for the two of us, as we’ve shared many a nature photo on Instagram! We had a hotel room in downtown Victoria and enjoyed several waterside restaurants, debriefing in detail each day’s highlights over dinner. How has your friendship changed post-WordsThaw? Have you any future plans? Mary Gait: I would say our friendship has solidified as a result of meeting and taking in this event together. I believe our shared experiences have enriched our interaction both online and over the phone. I acknowledge that having Lisa come to the Island involved a huge commitment of her time and resources, an investment I hope to reciprocate in the future, though we do not have specific plans for a follow up meeting. Each of us has writing projects we are pursuing while immersed in our everyday lives of family, friends and community. Lisa Horst: One of the wonderful aspects of our friendship is an acute understanding and appreciation of the demands of motherhood and family life. My own life dove into overdrive upon my return, so it has been busy. Yet, when we talk now there is an ease and kinship since WordsThaw, as if no time has passed. The sharing of face time and the stimulation of an academic experience is uniquely bonding. As of now, we have no further future plans together but it would be nice for Mary to visit California someday and I do look forward to wherever our literary escapades take us in the future. Have your experiences at WordsThaw changed in any way your notions of community in writing? Mary Gait: Again, my experiences at WordsThaw most definitely affirmed my participation in a writing group and have given me greater vision for attending and promoting literary events, both locally and on a broader scale. Reading is a way to approach community as a writer. C.S. Lewis suggested “We read to know we’re not alone.” In the past several months, I have been immersing myself in good writing. Lisa is a bibliophile, so I never am short of suggestions. As a result of this event, I purchased the 2015 edition of The Best of Canadian Poetry in English. Having met Molly Peacock and Anita Lahey, I felt an affinity to them through their editorial essays, and I am appreciating the many talented community of poets featured in the collection. Lisa Horst: WordsThaw was a direct contrast to my experience at a literary conference New York City last year. The intimacy and setting created a down-to-earth atmosphere of community. The participants were each accomplished and dynamic, yet real. I left there eager to seek out that sense of connection with the literary community in my area through readings, writing groups, book talks, and local literary journals. I realize there are many resources available to those who seek them.